To add a new slide, tap the plus sign (+) in the lower-left corner (see the figure) and choose the style of slide from the gallery that appears. Want to add a bulleted list? Just choose a slide style with a bulleted list already on it. You can choose the layout for the slide you’re adding from the thumbnails shown in the popover. As this figure demonstrates, the layouts for new slides vary from template to template. Themes provide some slide layouts with image placeholders in them. To change a placeholder image, simply tap the Insert button (shaped like a plus sign) in its lower-right corner. 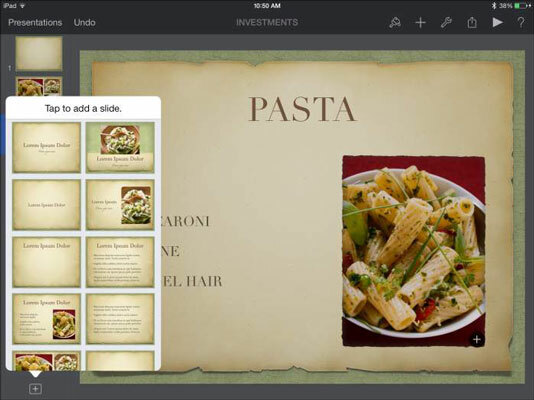 A dialog opens, showing media sources, such as your Photo Albums. Locate an item and tap to insert it. If you want to add an image outside a placeholder, make sure no placeholder is selected and then tap the Insert button. 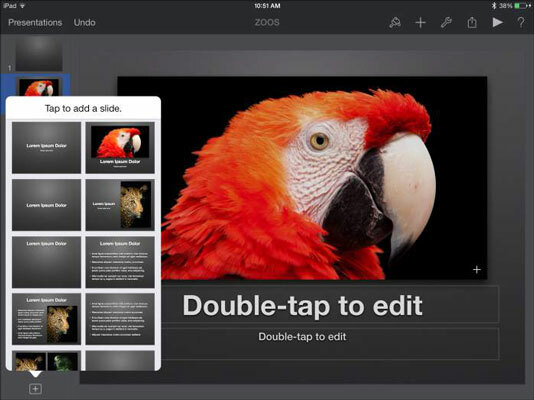 Tap any of the five tabs: Media, Tables, Charts, Text, or Shapes. Choose the item you want to insert, and it appears on your slide. You can now move the object around with your finger. You select an object on a slide with a single tap (the same as in Numbers and Pages). You can drag the object around; Keynote provides the coordinates for precise positioning and also provides you guidelines as you align the object with the center of the screen or the edge of another object. To resize an object, drag a corner handle until it’s the size you want and then let it go.